National Child abuse prevention month is an annual observance in the United States dedicated to raising awareness and preventing child abuse. 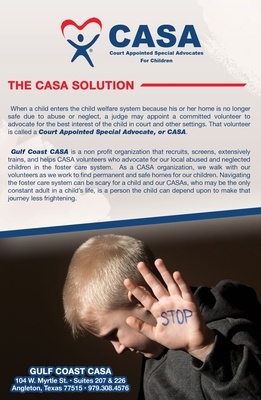 CASA?s mission to be the voice for abused and neglected children of Brazoria County who have been removed from their homes and placed in the foster care system. In order to complete their mission and provide services in our community they rely on the generosity of individuals and local businesses for support. 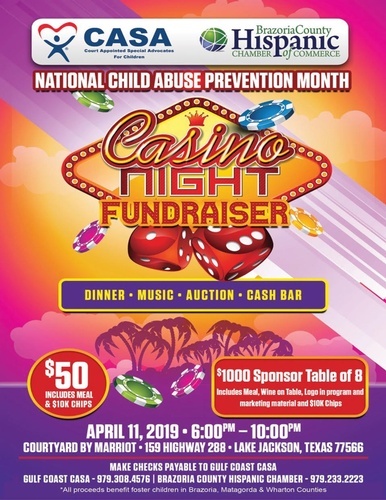 CASA will be hosting their Casino Night Fundraiser with all proceeds sent to benefit the foster children in Brazoria, Matagorda and Wharton County. Matagorda County CASA, Inc., dba Gulf Coast CASA, is a 501(c)(3) nonprofit organization. Your contribution is tax-deductible to the extent allowed by law.